Help us raise money for our PTA! The Mill Hill School Walkathon campaign has officially begun. This is the PRIMARY fundraiser for the PTA. 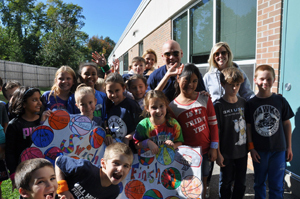 Last year, the Walkathon raised more than $29,000! HOW MUCH MONEY MUST WE RAISE? The Mill Hill PTA has an annual operating budget of $27,000. There are 364 students in the school. That averages out to $75 per child. We are asking each student to raise at least $60. While no donation is too small, please consider the wonderful benefits of the PTA and be as generous as you can. 100% of ALL money directly benefits your children! ALL DONATION FORMS AND MONEY MUST BE TURNED IN BY MONDAY, OCTOBER 16th TO COUNT TOWARD PRIZES! NEW THIS YEAR! We have an online payment option and will be accepting any combination of online payment and/or paper pledge forms with checks. THANK YOU Mill Hill Families for your generous support! Here are links to the Walkathon documents that came home in the backpacks. The Pledge Sheet is the one that needs to be turned in to the school with money by 4pm on Monday, October 16th to count for prizes. The Mill Hill Walk-a-Thon donation process is now available online! Payments can be made by using either PayPal or Debit/Credit card. It’s that easy! Multiple donations per child can be entered. We ask each student to try to raise at least $60! The Mill Hill Walk-a-Thon is a super-fun event which will take place on FRIDAY OCTOBER 20th. Every dollar raised will be used to support the Mill Hill PTA.